Beginning Sunday night, May 4, through Tuesday evening, May 6, Israelis experienced a whirlwind of emotions. On these two days, Israelis celebrated Yom Hazikaron, Memorial Day and Yom Haatzmaut, Independence Day. While America also celebrates Memorial Day and Independence Day, Israeli Memorial Day is very different day than Memorial Day in America. Independence Day celebrations are much more similar. In America, Memorial Day weekend, the last weekend of May, marks the start of summer and is a weekend of sales, barbecues, parades, and other fun activities. The Indianapolis 500 is held the day before Memorial Day, Sunday , as is the Coca Cola 600 stock car race. On Monday, Memorial Day, the day Americans are supposed to commemorate those who died while serving in the U.S. military service, some people visit cemeteries and memorials honoring those who died defending the country. Parades featuring military marching bands, servicemen and vehicles, are held in many cities throughout the U.S. The flag is flown at half-staff till noon and raised to full staff for the rest of the day. The National Memorial Day concert is held on the west lawn of the US Capitol. Also, traditionally, the President of the United States lays a wreath on the Tomb of the Unknown Soldier at Arlington National Cemetery and delivers a speech in remembrance of those who died serving their country, although sometimes Presidents have asked their Vice Presidents to fulfill this duty. Other Americans simply barbecue, go to the beach, or otherwise enjoy the day. Independence Day, July 4, is a totally separate holiday and not connected in anyway to Memorial or Veteran’s Day. Contrast this with the Israeli celebrations of their Memorial Day and Independence Day. Yom Hazikaron, Israel’s Memorial day, begins at sundown and ends at sundown the following day, as do all major Jewish Holidays. While Yom Hazikaron has been traditionally dedicated to the remembrance of fallen soldiers, those civilians killed in terrorist attacks are now also included. At 8PM, on the night of Yom Hazikaron, a one minute siren is sounded throughout the country to mark the beginning of the Israel’s Day of Remembrance ceremonies. All are requested to stand still in silence as the siren sounds. Many religious Jews say prayers for the fallen. The official ceremony marking the beginning of the day is held at that time at the Western Wall. The Israeli Flag is lowered to half-staff. A muffled trumpet plays taps. A candle lighting ceremony with speeches honoring the fallen is held at the Western Wall with the Israeli President, Army Chief of Staff, and family members of the slain in attendance. Other solemn gatherings are held throughout the country. The next morning, a second siren, lasting for two minutes is sounded at 11 A.M. Again, all are requested to stand still in silence for the duration of the siren. This second siren marks the beginning of the official ceremonies at all military cemeteries throughout the country. The main service is held at the military cemetery on Har Hertzl in Jerusalem. Families of the fallen, high level government representatives and members of the public are in attendance. Memorial ceremonies throughout the country are attended by the families of the fallen, public figures and representatives of the government, police, security forces, and the public. The central service is held at the military cemetery on Mt. Herzl in Jerusalem. Special prayers are said and public figures give speeches remembering the fallen and praising their sacrifice. The ceremonies often end with a military gun salute. Throughout the day, the media broadcasts stories about those who died and their heroic acts and interviews with families of the slain. The music played befits the day. Many stores are closed and the day is a somber one. At 1 PM a service is held at Mt Hertzl in memory of victims of terrorist acts. At about 8PM, the torch-lighting ceremony at Mt. Herzl is the closing event of Memorial Day, and the opening ceremony of Israel Independence Day. The Israeli flag is returned to full staff and the festivities begin. 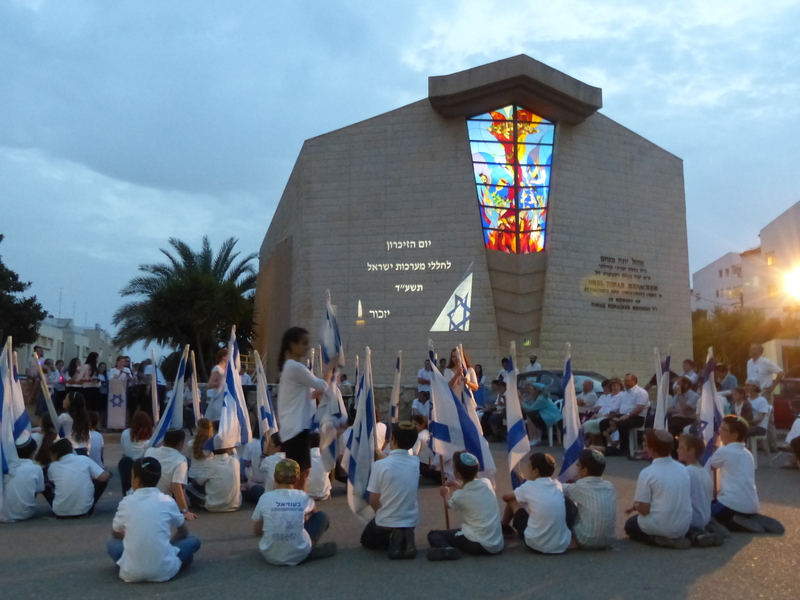 Israeli communities host their own Yom Hazikaron and Yom Haatzmaut, Israeli Independence day celebrations. In Bet Shemesh, at one synagogue, the end of Yom Hazikaron was marked by short student readings of a number of biographies of fallen soldiers and civilians killed by terrorist acts. As the bios were read, the person’s picture was projected on the outside synagogue wall. Many in the audience were brought to tears. At the conclusion of the readings, students performed a flag dance, signaling the end of Memorial day and the start of Independence day. Special Independence Day services were held in the synagogue including responsive Hebrew reading, a very long Shofar blast, acknowledgment of the Lord’s sovereignty and a wish for Jerusalem to be brought to its full glory. At the conclusion of the services, free falafel was distributed to those in attendance. 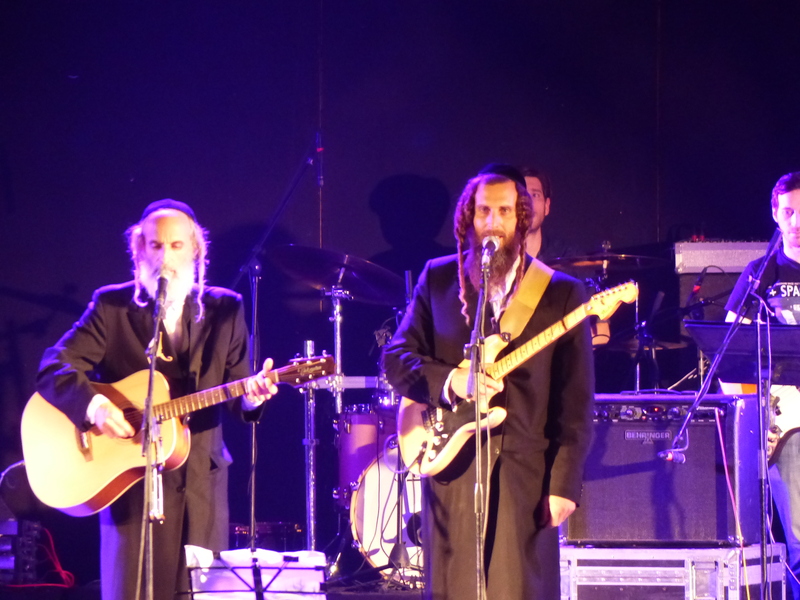 That night, Bet Shemesh also held a large free concert highlighting the Gat Brothers and Eyal Golan, a very well known Israeli singer. Festivities also took place at the Western Wall, other parts of Jerusalem, and in cities and communities throughout the country. Fireworks were visible throughout Jerusalem, Tel Aviv and the rest of the country, as was community dancing. That night and the next day the smell of barbecues permeated the air. Many went to beaches and parks to do the grill thing. The Memorial Day of solidarity and solemnity, which pays tribute to the fallen, makes the Independence Day celebration immediately following it much more meaningful and joyous. People understand that you cannot have freedom and independence without the sacrifice of the brave.